VersiDrain 6P is a perforated interlocking plastic drainage sheet designed for use between the structural slab and sand or mortar screeds. 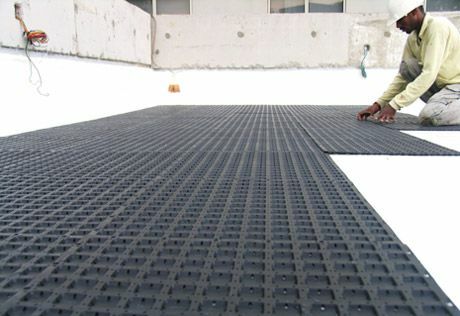 VersiDrain 6P under-screed drainage sheet is used in the construction of pedestrian walkways, plaza decks, balconies and verandas. VersiDrain 6P creates a drainage and ventilation cavity that allows trapped water in the screed to escape via perforations and drainage channels in the sheet. This ensures that water and salts in the screed are prevented from migrating upward, to the surface to form unsightly efflorescence and algae. VersiDrain 6P also acts as a separation layer and reduces tile and paver cracking caused by expansion of trapped water and movement of the structural slab.